My friend Deborah is more on top of it than I am and she starts looking the second she hears about a new author in one of her favorite genres. 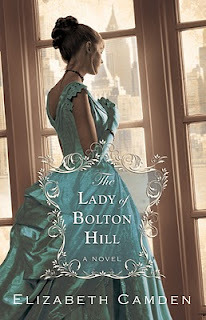 So as we were being our typical nerdy selves and chattering about upcoming releases in Christian fiction from one of our favorite publishing houses, Bethany House, she posed the question...who is Elizabeth Camden? Figuring she wasn't as skilled at ole google as I was (ha! ), I immediately googled Elizabeth Camden. Then Elizabeth Camden author. Nothing of importance, or nothing to indicate who this author might be. I could find Elizabeth Camden's as characters on other books. Nothing on the author, though. About the Book: In 1870, female journalists are few and far between, but American-born Clara Endicott has finally made a name for herself with her provocative articles championing London's poor and mistreated. When the backlash from her articles forces a return home to Baltimore, Clara finds herself face-to-face with a childhood sweetheart who is no longer the poor factory worker she once knew. In her absence, Daniel Tremain has become a powerful industry giant, and Clara finds him as enigmatic as ever. However, Daniel's success is fueled by resentment from past wounds. Clara's long-held beliefs about God's grace and justice cause Daniel to question his own motives, but when Clara's very life is threatened by an adversary of Daniel's, they must face a reckoning neither of them could have ever foreseen. So now I'm really curious about Elizabeth Camden, because I'm very interested in her book. Deborah's theory is that Elizabeth Camden is a pen name. My theory is that she has no idea how much we want to get to know her yet, and she hasn't yet started her blog. If you have any information about Elizabeth Camden, do tell! How about you readers? What kind of information do you like to find about an author when you google them on the internet? What are the bare necessities for an author website or online presence in your opinion?